Apparently, former DuPage Township Supervisor William Mayer has a problem with people posting negative comments about him in the closed Facebook group “Bolingbrook Politics” and contacted his attorney to threaten at least one of its administrators. 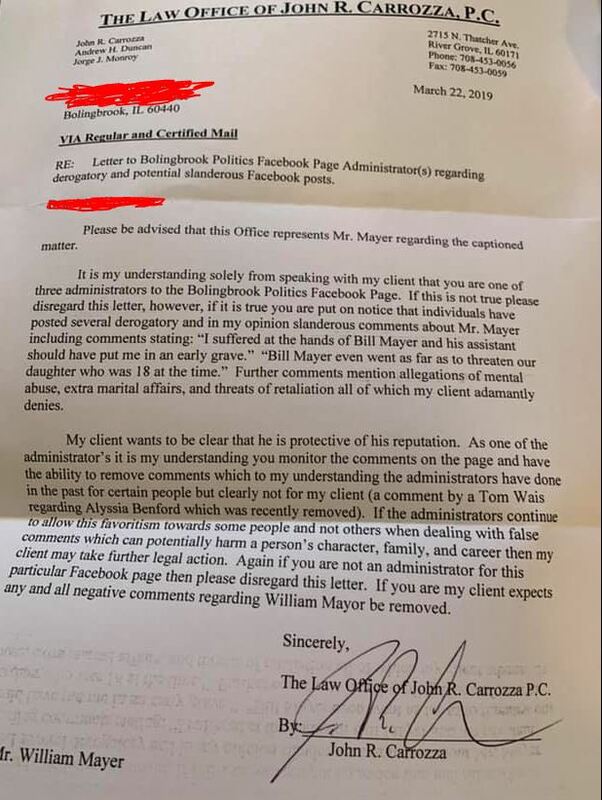 On March 22, 2019, attorney John R. Carrozza caused a letter (read it here) to be sent on behalf of William Mayer alleging that several posters to the page had posted several derogatory, and in his opinion, slanderous comments about Mr. Mayer. The letter further alleged that comments of mental abuse, extramarital affairs, and threats of retaliation were posted. It talks about favoritism with which comments get removed from the page and which comments stay, and even threatens legal action if the favoritism continues. We find it odd that the only threat of legal action was if the admin “continues to show favoritism” in how they delete comments (private page administrator can control posts on their page as they see fit), and no threat of legal action if the negative posts about Mayer were not removed. Just imagine, if you will, living in a world where anyone could remove all negative comments posted about themselves. But this is what Bill Mayer wants. Anyway, “methinks the gentleman doth protesteth too much”, which leads me to wonder whether the FB comments in question might in fact have at least some validity. Hopefully, the truth will come out in time. He is delusional and a stupid bully. He can’t even be a smart bully. Did his attorney spell his name wrong at the end of the letter? The letter was very hard to follow. Is that a real attorney? Who is his assistant? Why didn’t they say who actually made the comments about him so the administrator could find them. That whole letter is just crazy, like Bill and his wife.